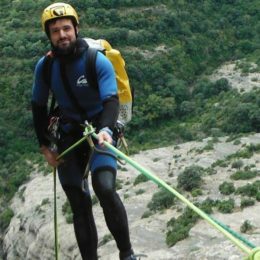 Join Julen, an AEGM certified guide, as he leads through a day of adventurous canyoning through the Viandico Canyon in the gorgeous Pyrenees. Come and join me on a day trip to the Viandico Canyon. This amazing canyon will offer you a glimpse of nature at its most stunning. Located in the beautiful Pyrenees Mountain Range, the scenery will leave you breathless. Canyoning can be for everybody. No experience is needed and you also don’t require a lot of equipment. Instead, all you have to be is at least 7-Years-Old, Know How to Swim, and be in a Normal Fitness Level. Thus making this day trip in the Viandico Canyon perfect for the whole family. However, for those people with an adventurous side, there is something for you as well. The Viandico Canyon offers an abseil of 14 meters, along with several possible jumps from as high as 8 meters. Whether you want to feel the rush of leaping into gorgeous turquoise water. Or you prefer admiring a truly spectacular looking part of the world. Regardless of your preferences, this trip will leave you satisfied. So come, indulge in this one day treat of a trip. You will not forget it. And just to make sure of that, we will give you a free photo album at the end! And if you would like to enjoy a more extensive day of canyoning in the Pyrenees, you can come with me on this trip. 9:00 am at the roundabout in Escalona Village. At the end of the day you will receive a free photo album. Accident and Rescue Insurance is included. There is a 10% discount for all groups of 9 people or more. Don't forget to bring a swimsuit, sport shoes or walking boots (they will get wet), towel and change of footwear, water and picnic lunch, Hair tie for people with long hair, and for people who wear glasses, you should bring a retaining cord or glasses case. I was born in the Basque Country, where the mountaineering is more than a simple sport, is part of the local culture. Now, living in the Pyrenees, I enjoy leading people in the best canyons arround Ordesa and Monte Perdido National Park and Sierra de Guara Natural Park. 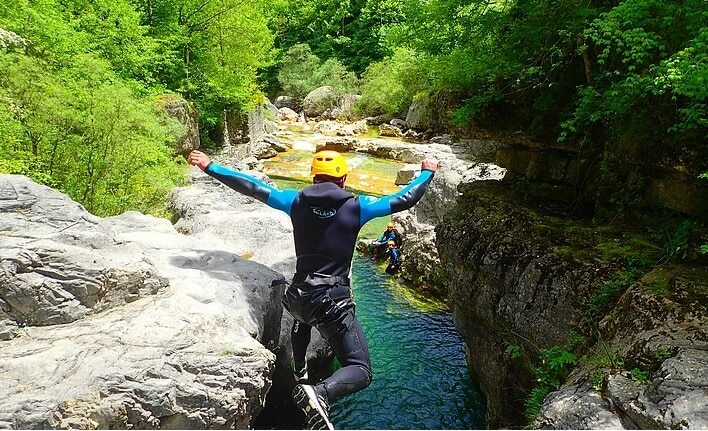 Canyoning is not my profession, it`s my passion! 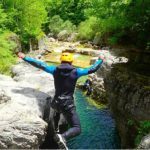 Canyoning - 5 days - Interm.